Free Cakes for Kids UK is made by people like you – a true community project. Most of our volunteers and organisers have a passion for baking and decorating breathtaking birthday cakes. But even if you do not consider yourself a great baker, there is a lot you can do. Can you bake a perfectly acceptable sponge and be creative with some decoration? If so then you can be a baker for Free Cakes For Kids Bristol We don't ask that you have amazing skills, just a passion for baking and making a child's birthday a bit more special. Once a volunteer baker agrees to bake a cake then all the details are sent through (normally by email) such as possible themes for the cake, child's age, delivery date and location. The baker then bakes the cake, using ingredients you have bought yourself, and delivers it to the drop off point. We appreciate that being a volunteer takes time and money, we can only thank you for that. As a community organisation, we unfortunately have no funds to subsidise ingredients. If the baker can't deliver the cake themselves, then it is sometimes possible for it to be collected. Just let us know and we'll see what we can do! To become a baker please email us on freecakesbristol@gmail.com, or use the contact form in the 'Request a cake' page to send a message. There are 3 forms to fill in and return before you join our happy band of bakers. - Confidentiality form, which is your acknowledgement that the details you receive about the child (such as age and name) must remain confidential. Not a great baker? We still need you! 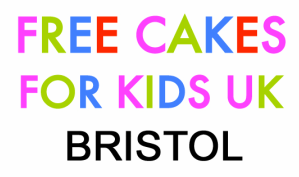 There are lots of others ways you can help Free Cakes for Kids - Bristol, even if baking is not for you. Some ideas are below. If you want to help, please email us on freecakesbristol@gmail.com and we can discuss the options. - Donate - we do not receive any funding for any of the work we do. Are you able to donate some cake boxes, how about some eggs from your chickens, or a gift card from your local supermarket? Do you run a shop that can donate some ingredients for baking a cake? How about offering printing services for our publicity? If you can donate, then please consider what little you could give and will we transform it into a wonderful birthday cake for a child. Alternatively take a look at our Fundraising page for details how your online shopping can raise funds for us. - Logistics - perhaps you could help collect and deliver cakes for those bakers who don't have transport? - Raise awareness - we always need people to spread the word about what we do, why we do it and how we make a difference. Good at networking? Able to put up a poster in your local health centre or community area? Then we need you. - Recommend a partner organisation - most of our referrals come through our partners, why not make more organisations aware of our work through your contacts? - Start a new group - Free Cakes For Kids Bristol covers Bristol and South Gloucestershire, but there is always a need for more groups in the South West. If you can organise things and people, then you could be a coordinator. You will be fully supported to set up a new group. Just getting a small thank you for making a difference on one child's birthday is reward enough for the effort!